Cardiopulmonary Resuscitation, also known as CPR, is a process for keeping a heart beating. Although this process of chest compressions and artificial compressions is known widely for humans, it also works on pets. If you cannot hear or feel your pet’s heartbeat, or if they are unconscious, give an emergency line a call right away. A pet that has ceased breathing will go into cardiac arrest, and it’s important to keep the heart beating in such an event. 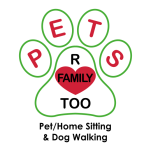 At Pets R Family Too, all of our dog sitters are trained in pet CPR and first aid. We have outlined the instructions for administering CPR below but it is important to understand that CPR can harm pets, or cause death, if performed when not necessary or improperly. We take no responsibility for the use or misuse of this information. Pet CPR should only be administered when absolutely necessary and only if the pet parent or administrator knows how to do so. When CPR is properly administered it can get the heart pumping again, as well as keeping the brain safe until breathing begins again. Knowing when to administer CPR hinges on having proper training. However, if you cannot get to a vet in time and your pet is unconscious or has choked, drowned, or been electrically shocked, then it may be necessary to begin CPR. Call your local vet and share the complications that your dog is having. Ideally, someone else should be doing this while you administer CPR. Lay your dog on their side on a flat and firm surface. Identify anything that may be lodged in your dog’s throat and remove it if present. Compress your dog’s chest about an inch, with your palms on its chest area, 100 times a minute. If you are the only person on the scene, breath into the dog’s nose every five compressions. Otherwise, another person can provide artificial respiration every three compressions. During artificial respiration, make sure that your dog’s muzzle is closed. Do not stop administering CPR until your dog’s breathing or pulse becomes apparent again, or help has arrived. If CPR has continued for 10 minutes and has not succeeded, you may stop. Administering CPR to a dog that weighs over 30 pounds is similar to the process outlined above. However, bigger dogs will need to have their chest compressed from the rib cage area close to the heart and at a rate of 80 compressions a minute. Although this may seem like a lot of things, it is nothing compared to how you will feel when you are fully prepared in the event of an emergency. In order to keep your first aid kit up to date, make sure to replace anything that is expired. Also keep it out of reach from children and pets.